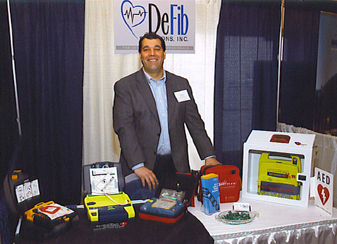 Vincent E. Penna, is President and founder of DeFib Solutions, Inc. After twenty years at the Union League Club of Chicago, one of the top rated private city clubs in the United States, Vince resigned as the Assistant Athletic Director, a position he held for 17 years, to begin DeFib Solutions, Inc. In addition to the Asst. A.D. position, Vince chaired the Club's Safety Committee and was responsible for the safety training of the 300+ employees. Among his credentials, Vince is a certified American Heart BLS Instructor and Training Center Faculty at Rush University Medical Center-Training Center and an Authorized Provider of the American Red Cross Workplace Safety Programs. A former EMT, he is also a certified TIP's/BASSET Alcohol Awareness Instructor and a certified Food Sanitation Instructor by the Illinois Department of Public Health. Cathy A. Penna, is Vice-President of DeFib Solutions, Inc. With over twenty years of experience as a Cost Accoun tant, Cathy brings a wealth of accounting and office management knowledge and experience to DeFib Solutions, Inc. In addition to running the office, Cathy is an Accounting Manager for a mid-size company in Northwest Indiana. An avid runner, Cathy just completed her seventh half-marathon.